The paranormal is a strange thing. This interview is with G. Michael Vasey. 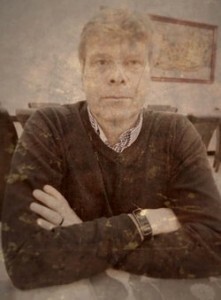 A writer who spends much of his time documenting cases of the paranormal. His books on the subject have been some of the most popular written in the last few years. This interview will be all about his experiences. From strange experiences, to ghosts to the unknown..
You can learn more about G. Michael Vasey by visiting his very popular blog here. You can also find his books here. What was your first experience of the paranormal, and how did you react to it? The earliest experience that I recall (though probably more as a result of having had it told to me so many times rather than a true recollection), occurred when I was just 3 or 4 years old. I had been put to bed in my room, and I saw a little blue man jump out of the mirror of my wardrobe. He jumped onto the end of my bed and held out a toy pistol and shot me with it before jumping through the window and into the night. My parents heard the gun shot! I was pretty shocked by the whole thing, I think. Did you ever become used to the paranormal, or does it still shock you? No, not really. But as I have got older, my natural psychic ability has waned, and I have learned a lot. I still feel atmospheres and see things but in a different way. For example, when we first bought our apartment, renovated it and moved in, I could sense a presence here. The first night I spent alone, I could not sleep hearing cracks and bangs and seeing movement out of the corner of my eye. I eventually got up and left to spend the night in my office elsewhere. The next day, I went through each and every room conducting a pentangle ritual to cleanse the house… All has been well since. Why do you think some people are sensitive to paranormal incidents and others are not? If you believe you will be sensitive, then you are. We do create our own reality to that extent, I think. There is a reason things don’t happen when a non-believer is around, and that is because their reality won’t allow it to happen! Everything is energy. The energy of not believing is very strong and it permeates everything. However, I always do enjoy those moments when a non-believer is confronted with a challenge to their reality. Later, they will deny anything happened, of course, but to see them jump and show fear is fun in and of itself. What was the “definitive” proof for you that the paranormal exists? There is no definitive proof. People see what they believe they will see. Reality is all in their heads, and if they have the right set up, they will see; if they don’t, they won’t. However, for me, it has been meditational experiences as well as things moving around that gave me the proof I need. What was the most terrifying thing that ever happened to you? It was the visitation in my brother’s room one night when I was home from college. The front door being opened, footsteps slowly creeping the staircase along with rasping breathing sounds, the door knob being slowly turned, the door beginning to open… My father heard it all, too, and my brother saw the door opening. I was terrified. Do you believe that spirits are here to help or cause harm? Is there any way to tell between the two? Just like those around us, spirits can be of any disposition. Some are helpful, some playful, and some just feed off of our fear. Why did you decide to start writing books about the paranormal? I have been blogging at various sites for over a decade and always wrote about my experiences. I wrote my first book in 2006 called Inner Journeys (Thoth), and I documented some of my experiences in it. At some point, I decided to try writing specifically about the paranormal, and somewhere along the line, I got hooked. What do you think readers get out of reading about your experiences and the experiences of others? Hopefully, they enjoy the books and they have something to think about. At the heart of all of my writings are really questions about reality. This has always been a fascination for me (see The Pink Bus, for example). So, in the end, I hope they are entertained and also that they start thinking about what is reality? What is life all about? Do you think people are right to be scared of ghosts, or do you think there’s too much fear of the paranormal? We are always afraid of the unknown, so I do think many will be scared by ghosts and things that are not readily understandable. I believe that some entities feed off the at fear – it is their food. So, I would advise people not to give in to fear but try getting angry instead. It always seemed to be the antidote for me. Why do you think ghosts visit us? Many and varied reasons from trying to tell us they are still there to warning us of things that we cannot see in terms of the future. Some ghosts are real spirits and some are energy loops replaying over and over and lacking any real intelligence. Even from physics, we know that everything at its most basic level is energy. We have been born and bred to see patterns, but we actually block out a lot of what is there. I think we are surrounded by spirits and energies, and most of the time we chose not to see it. Sometimes, for some reason, we do; and then we see ghosts or experience paranormal activities. So, are they visiting us or do we just get occasional glimpses of a different reality? Would you ever advise using communication devices like Ouija boards to contact spirits? No, I would not. This can result in significant issues. Ouija boards are not games, and unless you know very well what you are doing, leave well alone. You can read all sorts of other people’s experiences playing with these things, and many have very disturbing experiences. Where can we submit stories to you to have them included in one of your books? You can go to my ghost experience website and submit your experience there – its called My Haunted Life Too, and is full of reader submitted stories. Last question—what do you think happens to us when we die? 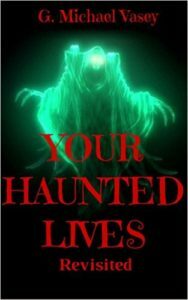 Your Haunted Lives – Revisited, edited by G. Michael Vasey, is the second super collection of creepy, often downright terrifying, true experiences of the paranormal submitted by visitors to the My haunted life too website (http://ww.myhauntedlifetoo.com) and the follow up to the supernatural Amazon hit – Your Haunted Lives. It features a foreword by English Medium – Andy Hopkins, to create just the right ghostly atmosphere. This collection of Mystifying, Scary, Real Life Ghost Stories are true tales of ‘Horrifying Encounters’ with the Supernatural and paranormal. They include visits from terrifying entities, haunted houses, strange and scary poltergeists, Attempted possession, Ouija board nightmares, evil demonic forces, haunted cemeteries, haunted places and much, much more. They will chill you to the bone! These are supplemented with true stories of the editor’s own strange and scary experiences. This terrific, terrifying collection of true spooky stories of the paranormal will keep you looking over your shoulder and wide awake…. You can download your copy here. I agree with most of what you have said about the facts related to supernatural phenomena, except that anger can prevail spirits. To some degree our anger can represent our self confidence that fear does not deter us from confronting the force of the other world. However, the devils are…, based on my own experience and from what I have heard, tougher than some normal ghosts. They are harder to deal with. Yes, I believe you are correct in saying that not all spirits are evil. Just like people in our world, some are nice, some are not. Furthermore, I do think it is fun to see how the non believers react to their own experience with the supernatural incidents. In my opinion, being skeptical is good, but to some extent only. Some people have to eyewitness it to believe it.